This report, highlighting a hot wind turbine main bearing, demonstrates how far from the “wind farm norm” a component can be while still not triggering any turbine alarms. Wind turbine control systems work on simple thresholds. In this example the alarm threshold might be 70°C. Until the wind turbine main bearing reaches this value, no one is alerted to the potentially damaging condition that is causing elevated temperature in this particular unit. Even upon generation of a warning in the wind turbine manufacturer’s SCADA system, it can go undetected, lost in the sea of other alarms and event codes. 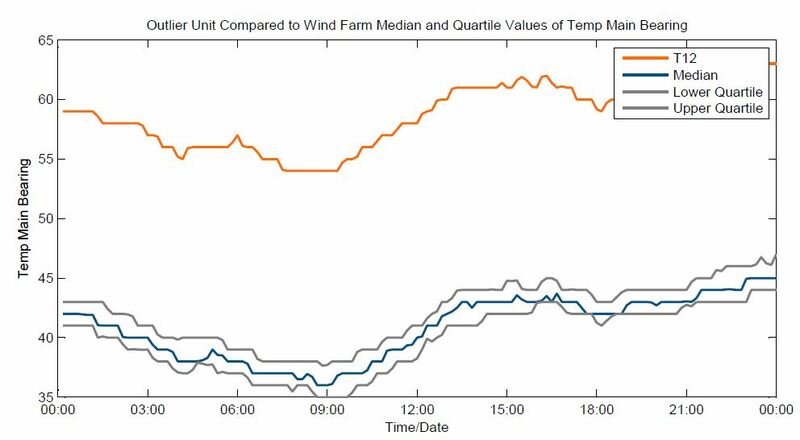 Wind turbine T12 main bearing temperature trend against wind farm median and quartiles. A condition such as this can exist undetected all winter. In the summer, the temperature of the main bearing may rise above the high-warn level and result in a temperature constraint (and lost production). Wind turbines operating at reduced output due to temperature constraints still register as 100% available on the downtime report. It is important to check for such conditions and address them as soon as possible. If the constraint does not result in OEM-allocated downtime and the wind farm is under an availability guarantee, addressing the issue may not be a high priority for the OEM as they will be focused on achieving their availability target (refer to my post on the gap between availability and profitability for more). Timely proactive wind turbine maintenance can avoid damage and lost production. Elevated main bearing temperature may be able to be easily fixed. For example, a misaligned lubrication nozzle, incorrect grease dosage or a grease leak upstream of the nozzle. All of these causes can occur at any time during the life of a wind turbine. Continual analysis of the SCADA data maximises the value of the information contained within wind farm SCADA historians. Through automated, daily analysis of the SCADA data, SCADA Miner is able to alert wind turbine technicians to investigate the cause of the elevated temperature and address the problem by performing proactive maintenance before it causes lasting damage and lost production. If the issue cannot easily be resolved, at least a failure can be planned for and in some cases the component can be changed out an an opportune moment (e.g. when a crane is on site).